Synopsis : Exhibition at Kean University Nancy Dryfoos Gallery in Union, Diane Pokorski: A Reinvention, is a collection of line drawings inspired by the art and culture of Italy and informed by the artist's disability. A new exhibition at Kean University's Nancy Dryfoos Gallery in Union, Diane Pokorski: A Reinvention, is a collection of line drawings inspired by the art and culture of Italy and informed by the artist's disability. A Reinvention will be on display through Wednesday, May 30. "Pokorski's artworks are consistently spirited and remarkably detailed," said Neil Tetkowski, director of Kean University Galleries. "The drawings are done in pen and ink; the simplicity of staying with black and white provides for clarity in these beautifully interpreted images." Pokorski spent her earlier years in Italy, and was inspired by the picturesque Tuscan landscape, Renaissance art, Medieval architecture and fashion sense of Florence. She later returned to the United States and became a master seamstress at the Fashion Institute of Technology. 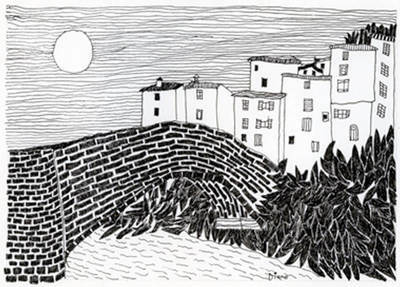 Diane Pokorski's A Reinvention, on display at Kean University in Union through May 30, is a collection of line drawings inspired by the artist's love of Italy and informed by her acquired disability. In 2001, Pokorski sustained a severe brain aneurysm that caused aphasia, blindness in one eye and partial paralysis that affected her ability to walk. Through years of rehabilitation, she remained focused on her acute sense of creativity and reinvented herself as an artist, drawing scenes from her beloved Italy. Admission to the gallery is free and open to the public. Hours: Monday - Friday 8 a.m. - 10 p.m.; Saturday 9 a.m. - 8 p.m.; Sunday 1-10 p.m. Founded in 1855, Kean University has become one of the largest metropolitan institutions of higher education in the region, with a richly diverse student, faculty and staff population. Kean continues to play a key role in the training of teachers and is a hub of educational, technological and cultural enrichment serving more than 16,000 students. The University's five undergraduate colleges offer 50 undergraduate degrees over a full range of academic subjects. The Nathan Weiss Graduate College offers five doctoral degree programs and more than 60 options for graduate study leading to master's degrees, professional diplomas or certifications. With campuses in Union and Toms River, New Jersey, and Wenzhou, China, Kean University furthers its mission by providing an affordable and accessible world-class education. Visit www.kean.edu. Kean University Galleries has a rich and diverse exhibition program that highlights cultural issues and are interdisciplinary in nature. These free, public programs are designed to educate and engage gallery visitors through the visual arts. Resulting dialogue further encourages visitors to think, share, question and collaborate. At Kean Galleries, we believe that art is an effective vehicle for building awareness of critical world issues and initiating social change. *News Release by Millie Gonzalez - Kean University: Disabled World makes no warranties or representations in connection therewith. PR content may be edited for style, clarity, and/or length. If you are connected with this page and want it corrected/updated please contact us.